- What Is Equine Assisted Psychotherapy? For parents seeking direction and guidance when home environment is no longer an option. Ziggy PHD (Professional Helping Dog) is now available. If you would like for Ziggy to participate in your session, please let Janet know. He received most of his training through his friend Rocky, my first therapy dog. 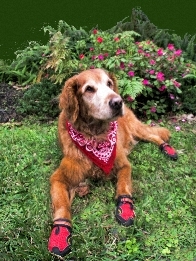 Rocky loved deeply until his very last breath on April 18, 2008. Ziggy aspires to help others the way his mentor did. This is individual therapy using horses as a method of learning about ones self and others. This service is offered off site at a nearby arena/horse facility. This methodology uses dogs to assist in the therapy process. Some clients are welcome to bring their dogs to sessions. Please check with Mrs. Nicholas to see if this is an option.